The First time I heard a Meera bhajan was from a Carnatic Musician - the renowned M.S.Subhulakshmi and much later in the inimitable voice of Pandit Kumar Gandharva [North Indian Classical Musician]. Memories vividly etched in my mind. Meera Bhajans have a haunting quality about them . . . every line, every word demonstrates the joy of being in love with her beloved Lord Krishna. . . Translated from Hindi by Baldoon Dhingra. a serpent curled in a basket. and drew out an image of the Lord. it tasted like nectar from the skies. Once the Raja sent me a bed of nails. It was as soft like a bed of roses. For the Lord protects her from harm. In medieval India Bhakti Movement was started by enlightened saints like Ramananda, Kabir, Chaitanya Mahaprabhu, Gurunanak and others. They showed the path of Bhakti to attain salvation. Meerabai belonged to that cult. Born in early 16th century Meerabai belonged to the royal family of Mewar. 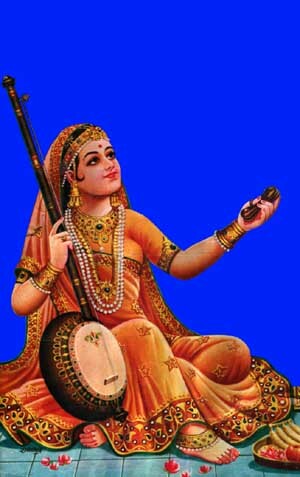 She renounced the luxuries of royal life and became an ardent devotee of lord Krishna. Meera composed many devotional songs in praise of Lord Krishna which are sung to this day with great reverence throughout the country. She died at the feet of Lord Krishna of Dwaraka at the age of 67.